Peanut is a fairly independent and happy kid, except when I am doing dishes. He can be happy as a little lark playing toys, but once he hears that kitchen sink start up, he comes running and whining and tugs at my leg until I'm done. I've tried everything to keep him happy, from pots and pans to snacks to Mickey Mouse Clubhouse. But, I am learning that more and more I have to be creative when it comes to buying time to get something done. I didn't want to go out and spend a lot of money buying a water table, sand table or toys. In fact, I have found that toys lose appeal with my boys rather quickly. So, I was thrilled when we went to the Delaware Children's Museum and discovered they were using basic cheap kitchen supplies to keep the toddlers' interest. The first one I like to call "Redneck Water Table"
Obviously, this one is easy-peasy. 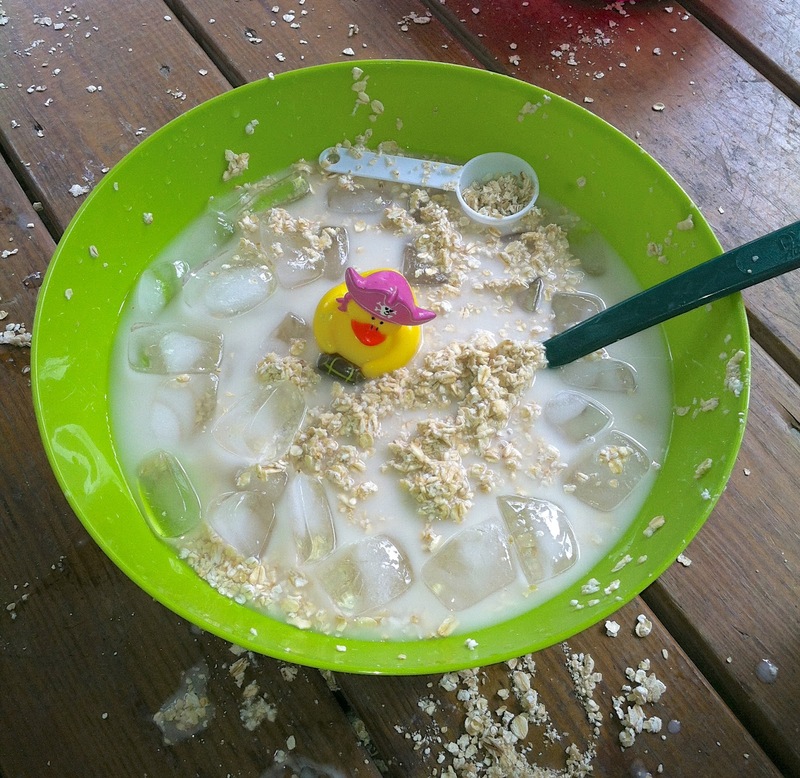 You definitely want to do it outside, because transferring water and ice from bowl to bowl gets quite messy. This is great to help toddlers develop fine motor skills and encourages independent play. My little guy loves doing this every morning on our porch. I'm kind of glad I didn't go out and buy a water table. This is free and he loves it. The second one I call "Ducky Oatmeal Bath." It's even messier than the first activity, so don't even attempt this one inside! Peanut loves his bath time *ahem* sink time. (We only have a shower) So, I decided to play off of that. I filled up his bowl with water and ice (he loves stirring the ice around the bowls) and put in the duck. Next, I gave him a small container of oatmeal and a measuring cup. He spooned the oatmeal in the water and stirred it around for a good while. Then he took the sponge and gave his ducky a "bath". He was happier than a monkey at a banana farm. The last and final activity I call "Nab That Noodle!" It is the least messy of the three. So, for moms who don't like messes, this one is quick and easy to clean up. It's also the most challenging for toddlers, so they really concentrate and work on fine motor skills. Prepare the noodles according to the packages directions. Once they have cooled, place in a large bowl with the food coloring of your choice. (I let Peanut pick his color...blue) Stir a small amount of the coloring just enough to tint the noodles. Then sit them in the floor with a bowl of noodles and all sorts of utensils to transfer them to the other container. You may need to help and demonstrate the first couple of times. 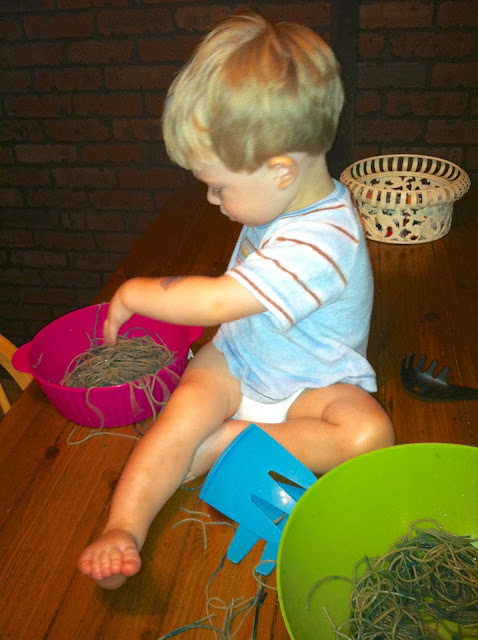 This is by far my little guy's favorite because he focuses so hard on grabbing the noodles! It's adorable! Hope these are helpful to you guys! Try them out and let me know how your kids liked them! I love your feedback! I love "ducky oatmeal" it's a must try. Yay! Nothing fancy, but they worked for me! Let me know how it turns out! I would love to see pics!!! Thanks gal! It's all easy stuff I do. I'm not complicated! Redneck Water Table! Love it!!! It never ceases to amaze me what some creativity on the part of a mama can come up. I agree! I'm not a Supermom, but I can pull a rabbit out of my hat on some days!